Long evening dresses are fixed stars into dresser of tonner dolls. Very simple pattern, very nice effect by very low effort. There is enought to choose suitable fancy material or to give attention to detail. If you are beginner or you need this clothes quickly and easy, this fit and fluent dress is sure choice. 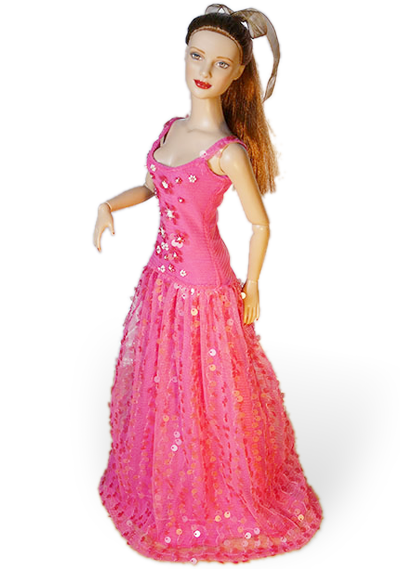 Long evening dress is perennial star in wardrobe of tonner dolls. 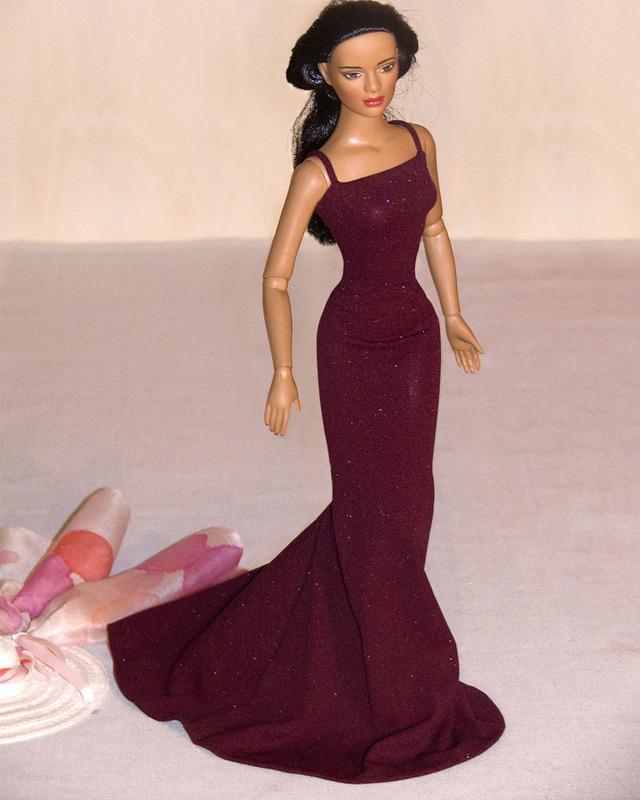 Long evening dress is perennial star in wardrobe of tonner dolls. Very simple pattern, that with making a little effort will bring very nice result. Simply select the appropriate effective materal, then possibly attention detail. If you are a beginner or if you need to dress a doll quickly and easily, this well fitted and flowing dress is safe choice. According to this pattern sew only from elastic materials that are only adapts to shapes of doll. The pattern counts up on the flexibility of the material - from another one would be hard to ever wear. The line of dress doesn't need any straps because it keeps well on the doll. It is one-part pattern with only one long seam on the back (blue draw) or you can use variant of two-part pattern (green draw) when the train is cut severally and sewn as wedge into back seam of dress. Your choose will be dependent on amount of available material or on your purpose of decorating of back part. Cut a piece of dress and first sew together back seam and next make a hem. If you are sewing of two pieces first sew together train part on one side and next all long back seam. Spaghetti straps are 5 cm long. Because the pattern is very simple and flowing, it proposes an using of accesories for noticeable changing. Classic change is to wear a scarf of strong complementary color or a decoration of bodice. Using of pipe sleeves is very effective with dress without straps. The dimensions of piece of sleeve are 4 x 11 cm. I've been looking for an easy pattern for doll clothes! Thanks!